It was with mixed emotions that saw Jacinta and I part company for another 2 months. It was great to see her and I missed her heaps. Her birthday weekend will be one to remember. A few more days together would have been great but alas, work calls her back home (someone has to pay the bills) and Te Araroa beckons me on. Lucky for me with the aid of a hire car Jacinta was able to kick start my day by driving around 6 kilometres on a section that I would have had to road walk. I didn’t start walking until about 10am or so and I wasn’t sure I would be able to reach my intented destination for the day, but 6 less road kilometres certainly helped. On the drive in we passed a young Kiwi lad, Ben, fresh out of school and hiking the Te Araroa from QCT to Lake Coleridge before uni starts. We offered a lift and he thought about it for a second but then declined, firmly stating, “Nah. I want to walk every step.” Great attitude for someone as young as Ben. Shortly after we passed 3 more trampers. We didn’t have room for 3 and kept driving but it was only when we passed that I realised that 2 of the 3 were Sven and Catherine from Germany. I haven’t seen these guys since Hamilton. Jacinta dropped me off and with a parting kiss she was off. I waited for Sven and Catherine and had a quick catch up and we all hit the road as there were still a few kilometres to get in before getting onto actual trail. I couldn’t wait. The road followed the Pelorus River and from what I could see from the road edge the next trail section wasn’t going to disappoint. The trail section traversed through beech forest for much of the day. Following closely by the banks of the river. The turquoise coloured water looked inviting, with its deep clear pools intersperse with shallow rapids spilling over white rock. It was a picture. For the most part the trail was pretty good. Steep in one section as it climbed away from the river to avoid a cliff and back down again. Several sections were sidles with out sloped tread with made it difficult under foot and there were a couple of sketchy climbs over the top of slips with sheer drops down 10 metres or so. Consentration was the order of the day for these bits. 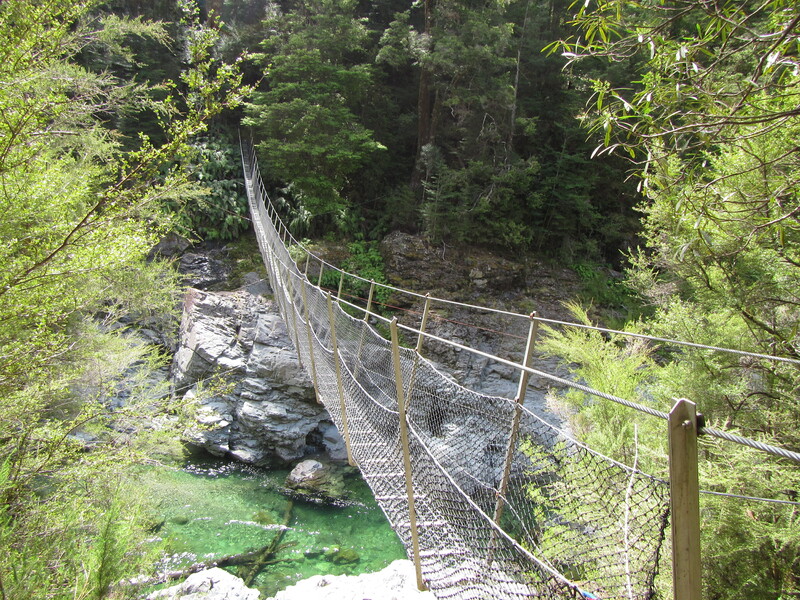 The trail also crossed several larger side rivers on swing bridges and crossed the Pelorus itself on one occasion. This was a wide crossing and a one person at a time crossing on the cable swing bridge. Crossing onto the southern side of the Pelorus the vegetation changes quite rapidly leaving the beech forest and entering into drier veg as the trail climbed steeply up. Though water was in good supply from the many creeks the trail crossed which was great as I was drinking a lot, more than usual. Once on the southern side the final few kilometres came easily and I arrived at Middy Hit in good time around 4pm. Enough time for a swim in the river. It was a hot day and I had been pouring out sweat all day. The river looked inviting enough although I thought it might be to cold. I found a nice deep pool and stripped off my sweaty cloths to lay them on the warm rocks and hopefully dry. With my feet in the temperature wasnt too bad. A little cold to go plunging straight in so I tried to inch my way in. But that didnt last long. One slip on a rock and I was in all the way. It was great. Being able to cool off after a stinky hot day is amazing. Once in, I wanted to stay in and I paddled around for a bit. My pool was over head height deep but the water so clear you could see to the bottom. Drying off on the rocks in the sun with my clothes looked like a good option but the sand flies soon found me. The worst I have experienced sandflies to date. The little buggers were everywhere, swarming around my ankles and legs and getting stuck in. A few drew blood before I could swat them. They just kept coming and it was time to retreat, ahhh…. Such a lovely end to the day spoilt by the bloodsuckers. It was a bit like northern Queensland – you have hot weather and the water is so inviting but you can’t go swimming due to crocs, stingers etc… The Pelorus River was the perfect swimming hole but the experience destroyed by insects. Plenty of bumble bees and wasps about too, all attracted to my white hat, and yellow bits on my gaiters. The colours must give off the impression of flowers. And so it was time to retreat to the hut. The lesser of two evils – stinking hot inside but no bugs. Tonight I would be sharing the hut with Ben and a couple of kiwi section hikers. Sven and Catherine opting to tent outside. It must have been difficult saying bye to Jacinta for the next two months. Just think of all the great catching up time you have ahead of you. The sand flies sound like the ones near the water at Orbost.